I've noticed that if you can start a taco joint anywhere down by the beach at Huntington Beach (and perhaps near any beach anywhere) and you serve even halfway decent food then you are likely to have a booming business. Somehow beaches and good, fast Mexican food go hand in hand and Las Barcas exemplifies this theme. Celebrating nineteen years of business (the banner out front says so) they are likely to continue to grow in popularity. When they called my name to alert me that my order was ready it was over a loudspeaker but it was so clear that I thought somebody had come out in the dining room and called my name. When I realized that I had to go up to the counter to pick up my food I first went to the takeout window to get it and saw something that didn't look like my order. Then I realized I was at the wrong place and had to go right back to the cash register window to get mi comida. Why I didn't remember this from my previous visits is beyond me (hey, I'm not perfect) but even for those savvy enough to remember the protocol there (i.e. everybody on the planet apart from me) you still have to break through the line of people waiting to pick up their take out orders to get your food then break through them again with your food and hope that no collision occurs. I had ordered the two tamale plate (#28 on the menu). One was beef and the other carnitas. One was covered with red sauce and one was covered with salsa verde. It looked so good that I started eating it before it dawned on me that I was supposed to take a picture of it. Also got a large Orange Bang (have I mentioned that I like Orange Bang?) and went back for flan after finishing off my dinner. They don't take credit cards at Las Barcas but they do have one of those little dinky ATM machines inside that charges you to use it . . . then your bank usually adds an additional charge for having used an ATM outside of their system, so come prepared with good old-fashioned cash. Thanks to Phil Pico, my photographer for the evening, a man whose roots in California/Mexican heritage run deep. Before I started this blog I searched around and surfed around the 'net to see if a site like this already existed. 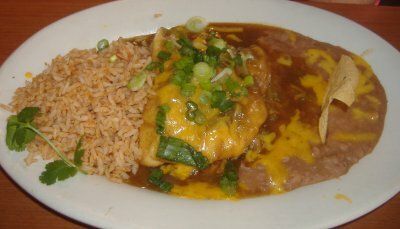 I found that there were a few others that were similar but they tended to be simply lists of Mexican restaurants in the county (lists that I could always tell were incomplete) or a review of a small handful of Mexican restaurants in the county without any apparent goal to cover any more of them. There are links to some of these sites over in the right-hand column of this blog. My blog that you're reading right now is still in a fledgling state but will attempt to be much more comprehensive and maybe even 100% comprehensive for its subject matter but in the meantime I'll point out an article that was pointed out to me a couple days ago. The OC Weekly recently published an article on Orange County's 61 best Latino restaurantes. Don't ask me how they came up with the number 61. Maybe they know there's only 61 worth going to. But it's still a good resource in the meantime. I've read through a lot of it and I seemed to agree with its assessment of the ones I've been to already and had my curiosity piqued about some of the others I haven't visited yet. I wondered if their usage of 'Latino' in this instance is a nod to political correctness but then realized that they are simply using it as a term that is a little broader than 'Mexican,' a term that could also include restaurants that focused on food from any Latin American region. The 61 is a completely random number—I could’ve gone on, but didn’t. As for "political correctness"...I take it you don’t read the Weekly much? Yeah, the whole "political correctness" thing was a thought that came and went very quickly. And I like the number 61. Who says that the number of items in a list has to be a multiple of 5? NEW UPDATE: I've removed the link as it doesn't seem to be working anymore. If anybody can point me to a properly working link please do so. LATEST UPDATE: Gustavo has sent me a permanent link. Taco Factory is what I refer to as a "rat race place." It sits in a fairly sterile strip mall in a very sterile business complex area of Irvine but if this is where you work then you don't have that many places to choose from for lunch so you go to what's close. The word "Factory" in their name doesn't help to downplay the mechanical nature of the overall Irvine business complex theme but maybe it's better than a name that ends with "Fresh Mexican Grill." For being in a sterile strip mall, though, the decor inside is more authentic than one would expect. They've got a fountain against a wall with a lions head that is constantly spitting out a flume of water and, not one, but two paintings of Frida. I don't even know who Frida is except that Salma Hayek played her in a movie biopic a couple years ago and she has the ultimate unibrow and lived about 75-100 years ago. She might've been an actor or a dancer or maybe even a deep sea diver for all I know. The food is prepared to order by Mexican cooks who appear concerned with making up each plate just right. I suppose they are sticking to their corporate slogan of "authenticity you can taste" and they do a commendable job of it. I've been to Taco Factory a couple times for lunch prior to this visit and had noticed that they had a breakfast menu and always wanted to try it. So I did. 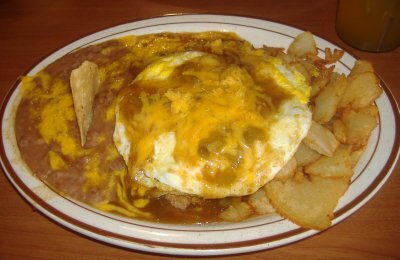 I ordered the huevos a la Mexicana platter, a scrambled eggs and salsa dish with beans and warm corn tortillas. It filled me up just right and when I got back to work my tummy wasn't all grumbly. I've been to a few Mexican places recently that were rather impromptu visits and I didn't go for the purpose of reviewing them. They are Del Taco, Las Fajitas, and Taco Rosa. Las Fajitas Grill in Irvine turned out to be a little bit better than it was on my previous two visits (2002 and 2003) so I may be a little quicker now about getting back there and doing an actual review sometime. Will have a review of Taco Factory in Irvine up in about two or three days and then will be hitting the trail to do some more exploring. Some of the ones I'm hoping to hit soon include Las Barcas in Huntington Beach, Playas de Sinaloa in Santa Ana, and Blue Agave in Yorba Linda. And, yes, I've been doing a lot of good home cooking and going to non-Mexican restaurants as well. I just don't write about them here. UPDATE - August 17, 2006: See end of this entry for information on their new location. This place was hopping busy and when I first took my place at the end of the line I was outside the door. They have a very extensive menu with a huge section of seafood items with dishes that include tilapia, catfish, octopus, oysters, shrimp, mussels, etc. Their walls have pictures of just about all their main dishes, which is helpful except for the fact that they have all faded so much they almost all look the same. When I finally got to the front of the line I ordered chicken picado and a bowl of albondigas soup that was so big it was its own meal. I ended up asking for two extra bowls and splitting the soup between me and my friend and my brother. When I had ordered at the counter they also handed me a plate of nachos with beans, cheese, and guacamole on them. I asked if it was free with every order and they said yes but my friend and my brother weren't given any. Then again, they may have realized we had come in together even though we ordered separately and they really just give one plate of free nachos per party. I was so full afterwards I didn't even bother with dessert but waited about an hour then went to Dairy Queen. After years at their current location Los Sanchez will, in the not-too-distant future, move to a new location near Harbor and Garden Grove Blvd. Their current digs are very authentic and there is a lot of history and character to it but hopefully their new location will be a little bit cleaner. Overall, Los Sanchez earns a solid three Speedy Gonzales rating and they will definitely be reviewed again when they move to their new location. This picture was taken by my friend Chris on May 11. It shows the construction site for the new Los Sanchez on Garden Grove Blvd. between West and Rockinghorse (a little west of Harbor Blvd.). When I was there last Friday night (May 25) the sign in this picture was no longer there but there was a new sign that said: "Los Sanchez - Coming Summer 2006 - Thank You For Your Patronage." We will post another update here when we find out the actual opening date. Here's a very recent photo of the Los Sanchez construction site. It appears that it could possibly open any day now but there is no sign out front giving an exact opening date yet. Stopped by the construction site last night with a friend who found somebody on the lot and asked when they were going to open up. The guy told him they would be open for sure on Friday the 18th with a small possibility they would be open on Thursday the 17th. If they opened on Thursday everything would be free that day. There was also an even slimmer possibility that they would be open on Wednesday the 16th but if they are we weren't told if food would be free that day or not. I am going to try to make it there one of those days. 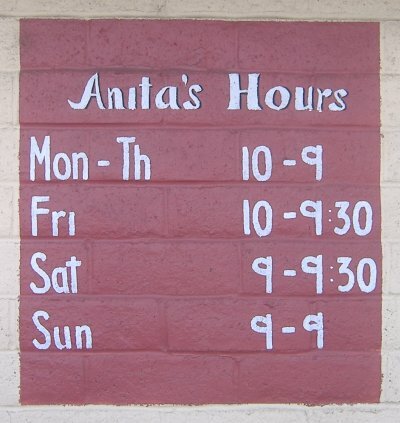 UPDATE: Anita's has closed down. This place was suggested to me by a good friend after he found out I had started posting reviews of Mexican restaurants recently. It's definitely a hole-in-the-wall, but it's a very respectable hole-in-the-wall. The outside appears rather generic but the inside is decorated with a number of native American artifacts that add the appropriate ambiance. They also have an outside walk up order window for those on the go. Not being very cultured at all I would've assumed at first that it was a Tex-Mex restaurant but it is actually Mexican food with a New Mexican flair. I suppose you could call it "New Mex-Mex." Or, to be less redundant, maybe just "New/Mex." Does anybody else know a better term? Anita's specialty is their sopaipillas (I thought it was spelled "sopapillas" but their menu says "sopaipilla," so for this review I will follow their convention), puffy pastries that you can stuff with food from your plate, or eat plain, or drizzle some honey onto (they bring you a big squeeze bottle of honey with any sopaipilla order). We got plenty of chips and salsa (I think I ate too many - I need to train myself to not eat too many chips before the main entree arrives). My friend ordered the "stuffy dinner" (so called because it comes with two big sopaipillas to stuff fixin's from your plate into), his wife ordered the carne asada plate, and I ordered the blue corn enchiladas. And I took advantage of the fact that they had Orange Bang on the menu to drink (whoever invented Orange Bang is a genius). For dessert we ordered, guess what?, more sopaipillas. This time it was a basket of seven smaller ones from the dessert menu and they came with a cup of chocolate dipping sauce in addition to the honey. Very tasty and one serving was enough for the three of us to share. I think on my next visit I'm going to try their apple cinnamon burrito. Hold your cursor over the Apple Stuffy to look inside it. My brother and I stumbled onto this place after we went to another restaurant and found out they didn't take credit cards. Well, Old Mexico takes credit cards. They even took mine. That's about the only thing up-to-date about this place. Everything else is good old-fashioned Mexican home cooking. I ordered the #18 plate, Costa de Azul, which consisted of bacon-wrapped shrimp which were excellent and made great custom-made taco stuffings. This is another place that is so authentic that they get thrown off when a gringo comes in and asks for corn (not flour) tortillas. The waitress, instead of asking if I would like corn or flour tortillas, simply asked, "You want flour tortillas, right?" "No, corn would be fine." Then when she summed up the order she again asked, "Flour tortillas, right?" "Corn will be fine." "Oh, right, corn." I wasn't too surprised when the food came . . . with flour tortillas. I decided not to ask for them to be switched to corn tortillas. Old Mexico has a buffet which I promised the waitress I would try on my next visit and a lot of other patrons there were taking advantage of it . . . and on my third visit I'm going to try that omelette my brother ordered. I don't know if posting this will automatically make me lose my credentials as one blogging Mexican restaurants but in all of my years of experience with them it wasn't until last week that I saw a menu board at one where the word "poison" was mentioned in the name of the item. I believe it was a breakfast item and possibly an omelette. Does anybody have an explanation? Apparently this Irvine location is so new that it is not even listed on the Locations page at their official site. There also doesn't appear to be any listing yet on Yahoo! Local or Google Local (that could all change almost instantly, though, given the nature of the Internet). It is almost tailor-made for all the Orange County suburbanites running the rat race (such as myself) who need to take a quick lunch break during work but who would rather not get pretzels or Doritos from the vending machine in the break room for the fifth time in a row. I noticed that a slogan painted on one of the walls inside read, "Eat More Fish," and I couldn't help but be reminded of the Crab Cooker's slogan: "Eat Lots A Fish." Does that count as plagiarism? If I had a litigious mindset I might think so. Who's taking the pictures here, anyway? I ordered the fish taco meal deal they were advertising on their little chalkboard stand and added a side of grilled zucchini. The beans that came with it were like pork 'n beans minus the pork; the rice was the kind that's perfect . . . with seafood, so in this case it needed to be pepped up a little with some salsa from their condiment bar (the salsa actually needed its own pepping up); the fish tacos were like a cross between those served at Rubio's and those from Del Taco; and, I should've checked to see if they had any parmesan cheese packets for sprinkling on to the zucchini, but sometimes you find it helps to have packets from Round Table Pizza sitting around in your junk drawer. This meal may have easily qualified as the most un-Mexican Mexican meal I have ever partaken of (except for maybe the time I had tacos with ketchup on them in Ireland, but that's a different story) but it still made for a decent lunch. As "elmomonster" mentioned at his Monster Munching Blog, the credit card machines weren't working but they acted as though I was the only one they never worked for. Fortunately I had the $7.80 cash on me to cover the meal. Then they handed me my number placard attached to one of those trinkets that holds the placard in place at your table; only problem is I was ordering my food to go so I felt a little foolish walking around with the thing while waiting and I had nowhere to put it (it was especially awkward when I was getting my drink at the soda fountain). Another wrinkle they may need to smooth over is the fact there's no logical spot in their counter space over which to hand customers takeout orders. They had to hand me mine over a whole bunch of clutter.